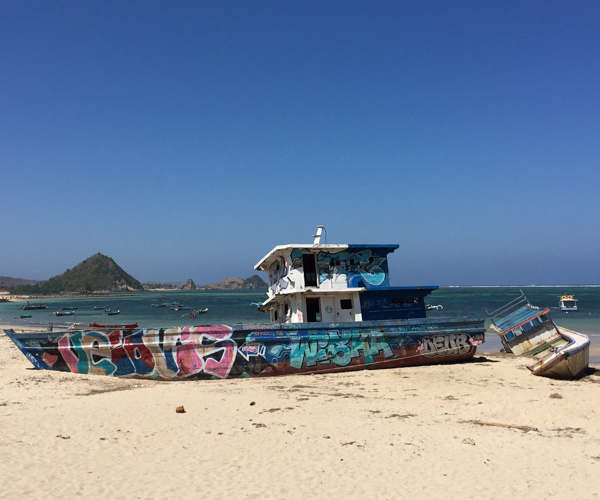 We headed to Lombok intent on eating tempe every day and checking out some of the beaches it is famed for. Having just left we can assure you that we ate tempe at least once each day (usually more) and the beaches are indeed stunning. 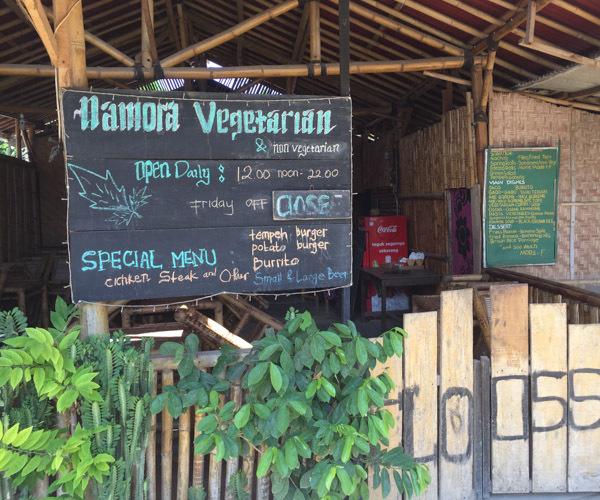 Our Vegan Guide to Lombok tells you about where we ate, where we tried to eat and a few vegan friendly luxury resorts in Lombok that we either stayed at or visited to check out their vegan food. 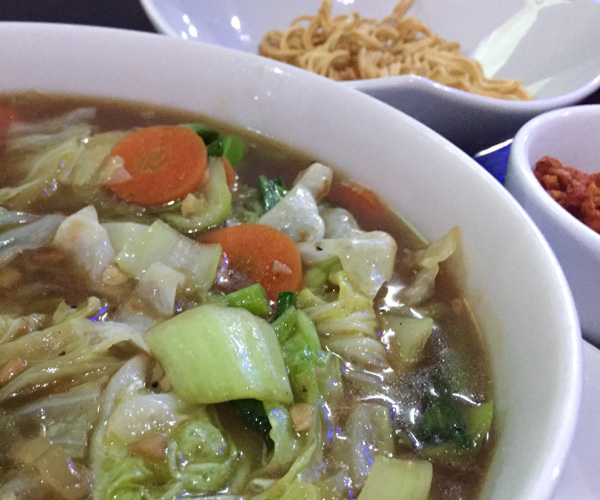 With just one night in Senggigi and arriving late we went looking for vegan food. 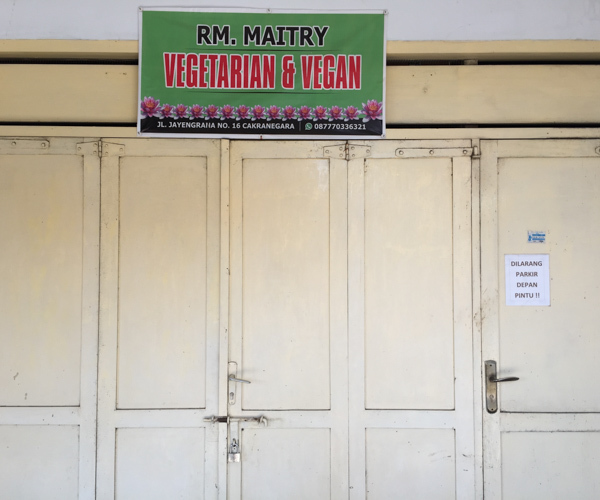 The friendly staff spoke good English and were able to understand that we were vegan. 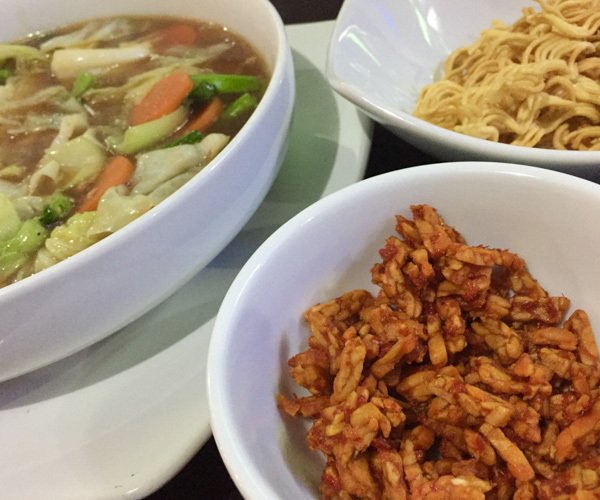 We ordered nasi goreng vegetarian (no egg) with a side of fried tempe and tami cap cay which was vegetables in a rich gravy with fried noodles. The food was well priced, tasty, filling and just what we needed after a long day of travel. Perfect. This simple roadside warung was so good we wished we were staying in Mataram longer to visit again. 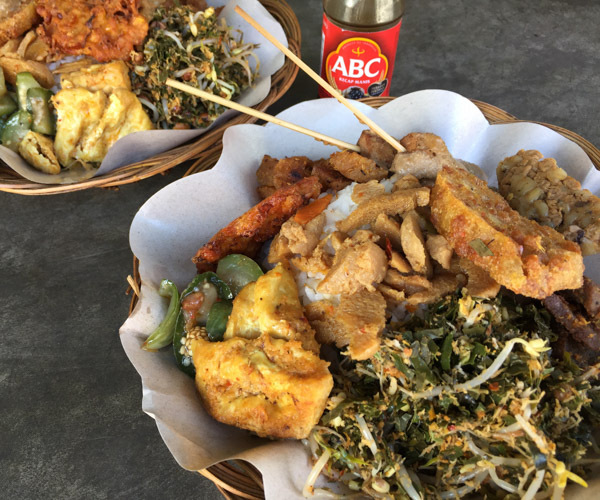 We ordered ‘nasi campur’ the content of which varies daily; ours included rice, urab salad, tofu, tempe, eggplant curry, sweet corn fritters, satay, sambal and a selection of mock meats. 2 large servings of ‘nasi campur’ and 2 of our own lunch boxes full to take away cost just 65,000 IDR which is just $4.50 USD. We were only in Mataram for 1 day and this was Sunday, we went past just in case it was open but it was indeed closed, so it would seem that the opening times are correct. We took a couple of pictures of the outside which will help you find it hopefully! 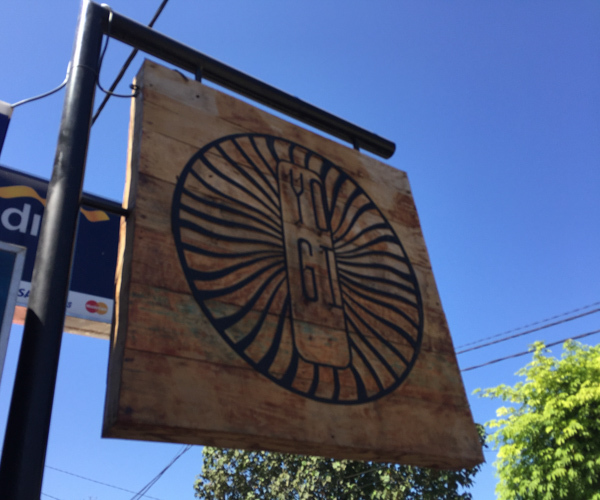 We headed to Yogi Bar as it was listed on Happy Cow and also looked to be on the beach. 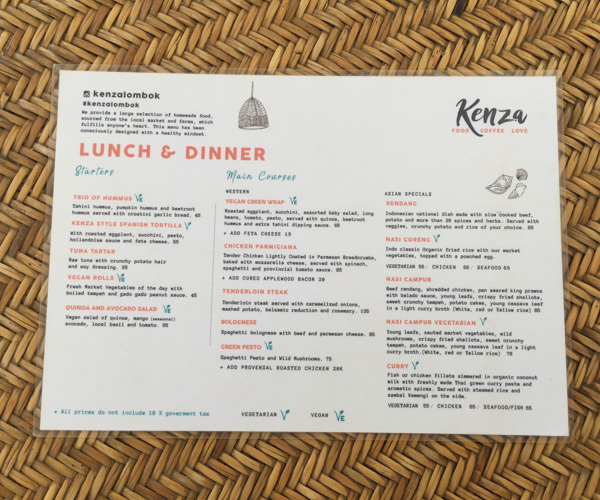 However, it appears to be incorrectly pinned on Happy Cow (we’ve submitted a new location) so we didn’t find it unitl after we had eaten lunch. 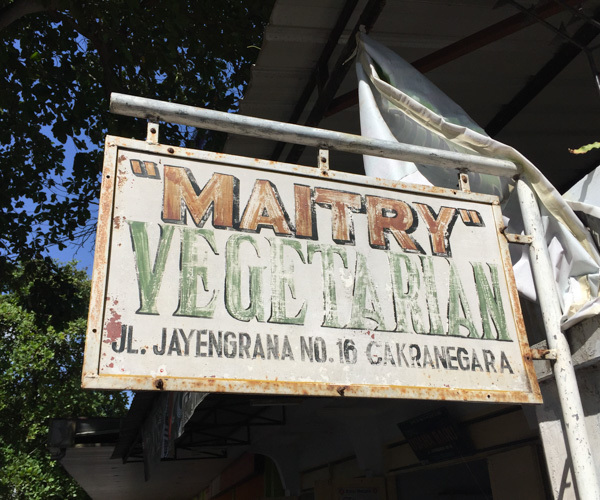 It’s actually on the main street and looked very nice with a few vegan options on the menu including a vegan nasi campur with red rice. We spotted Sea Salt when walking along the promenade and liked the look of it so explored further. We were so happy we stopped as the staff were friendly and there were vegan options on the menu. 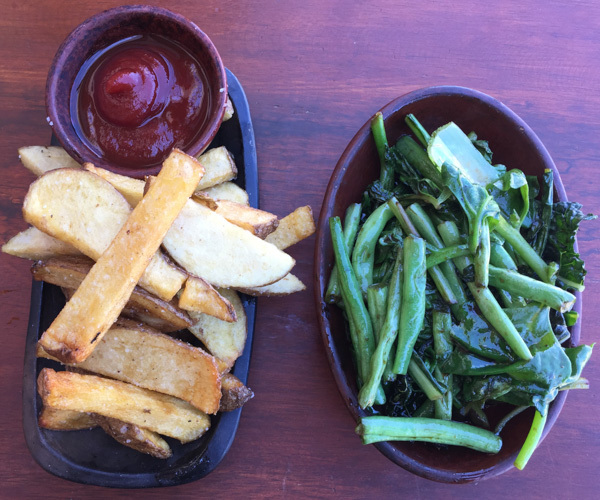 We opted for a quinoa and tempe salad (which had HUGE chunks of delicious tempe) and sides of hand cut fries and wok fried greens in soy. All was very good other than the greens which had too much sugar added. 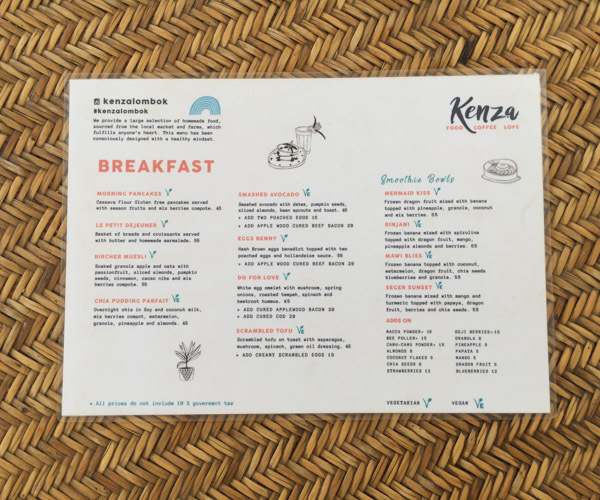 Kenza Cafe is a cool looking spot right on the main junction in Kuta. 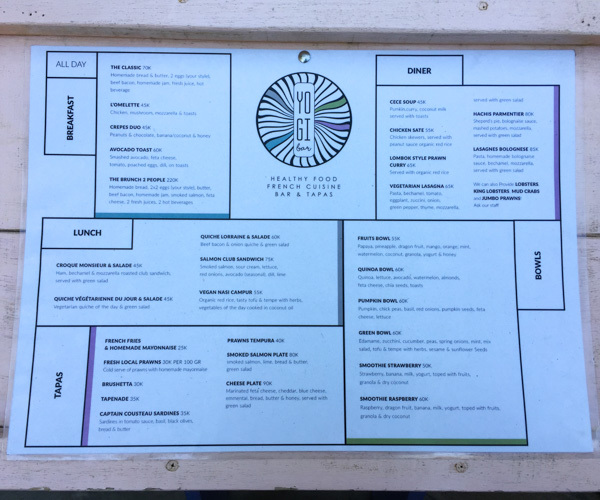 The menu is mainly vegetarian with a number of vegan options including scrambled tofu and vegetable wraps. We would definately head back there if we return to Kuta as we really liked the vibe. 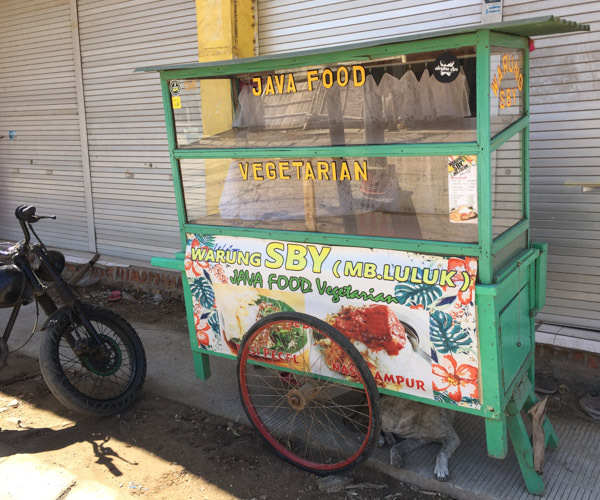 The elusive vegetarian food cart in Kuta. We had been told that this was worth looking for so we set off to find it. We can assure you it was not where it was meant to be, but sat looking rather forlorn on a side street providing sheletr from the sun for a dog! Please let us know if anyone finds this opening as we would love to know whether we missed out or not? Life doesn’t get much better than this. 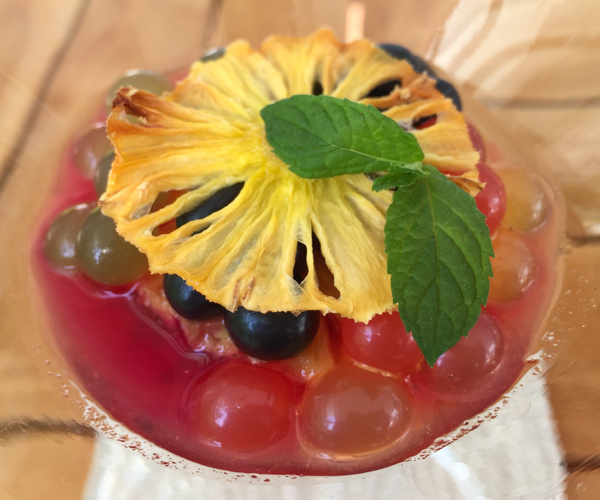 A stylish and sophisticated vegan friendly luxury resort in Lombok that has a Miami Beach or Ibiza vibe going on. 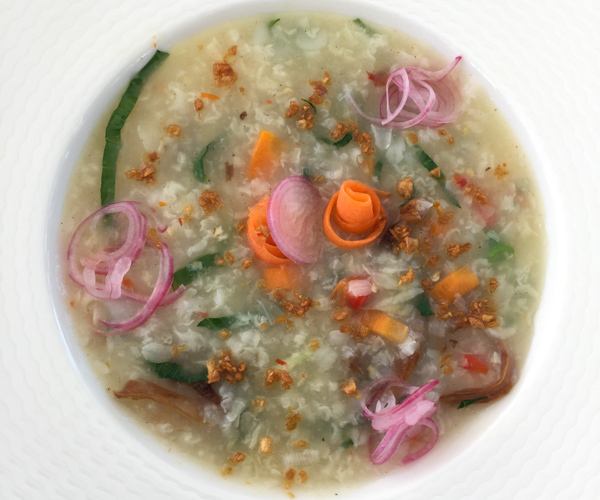 Add to this some of the most creative and tastiest vegan food we’ve enjoyed for a long time and you’re onto a good thing. It’s not cheap but the levels of luxury and service are high and the price reflects this. 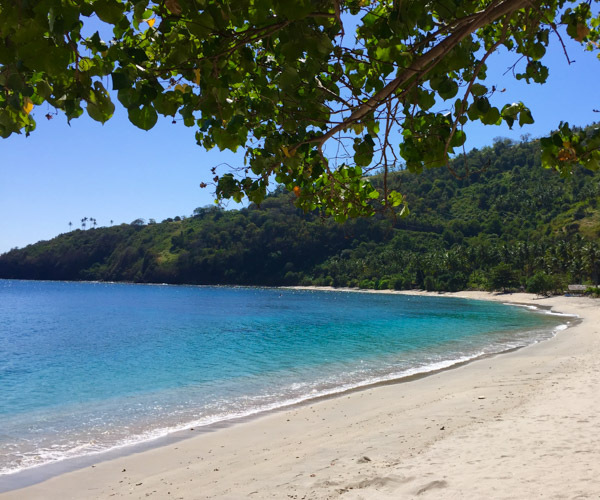 Here is our detailed review of 7 Secrets Resort in Lombok. Sprawling luxury private villa with 5 bedrooms, huge pool beautiful gardens and private beach. 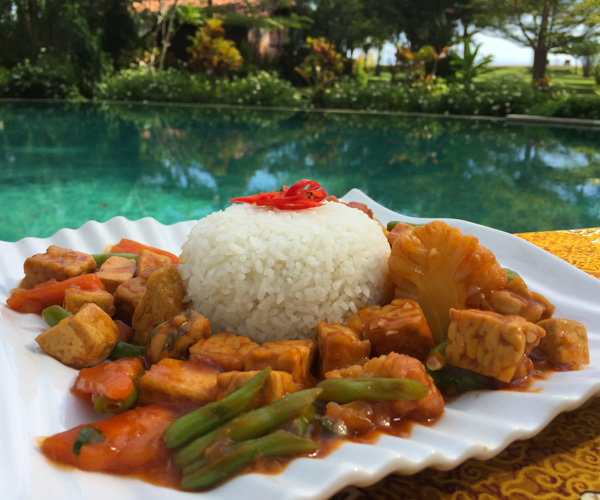 The staff team are happy to prepare food upon request and our vegan breakfasts were tasty as was our ‘family style’ Indonesian vegan dinner enjoyed next to the pool. 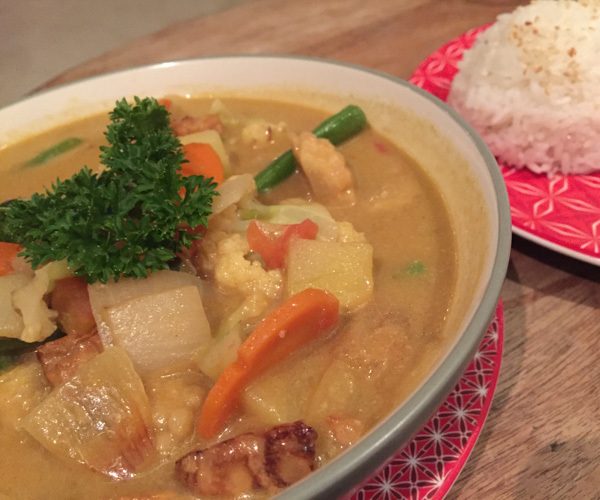 This is a place to head with a group of friends to really get away from it all whilst enjoying the authentic Indonesian surroundings and some damn tasty vegan Indonesian food. Here is our detailed review of Diamond Beach Villa in Lombok. 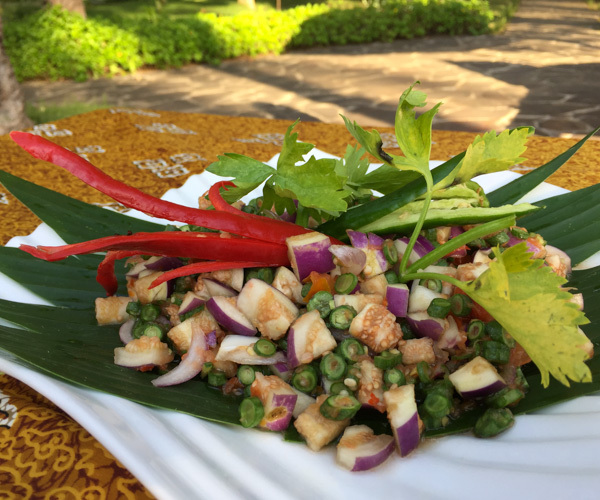 Think retreat, think yoga, think healthy plant based food and you won’t be far off with your expectations if you check in at Mana Lombok. 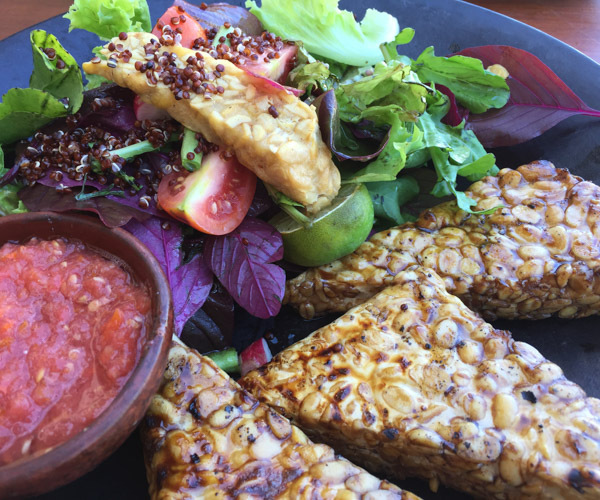 We stopped by to join a yoga class and for a vegan meal whilst in the area and were very impressed indeed. 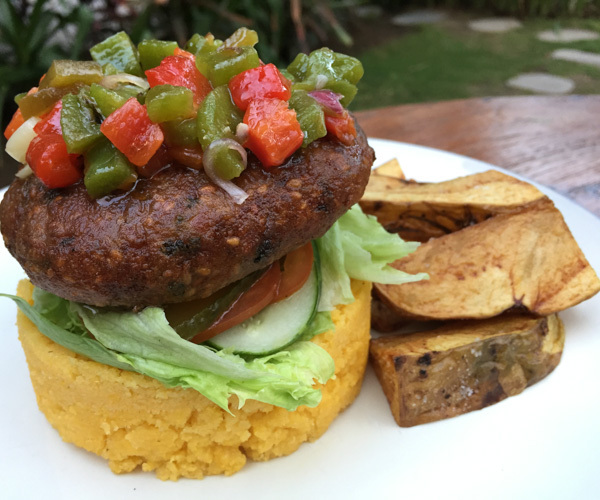 Caryl loved the yoga class whilst Paul chilled by the pool before enjoying two vegan options from the specials board including an awesome tempe burger served on polenta. Our home for a couple of nights in Kuta was Origin Lombok and we were very pleased with our choice. We communicated prior to check in to make sure that we would be well looked after as vegans and were assured this would not be a problem. 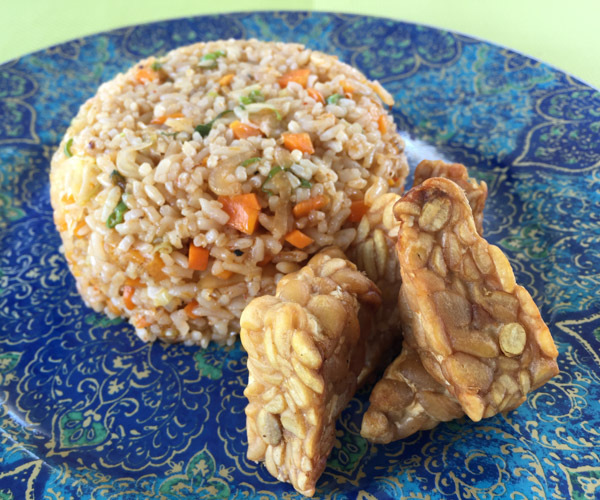 This turned out to be correct with the team happily preparing vegan fried rice with tempe for breakfast and for dinner we enjoyed a vegan pizza and also a simple but tasty vegetable and tempe curry. 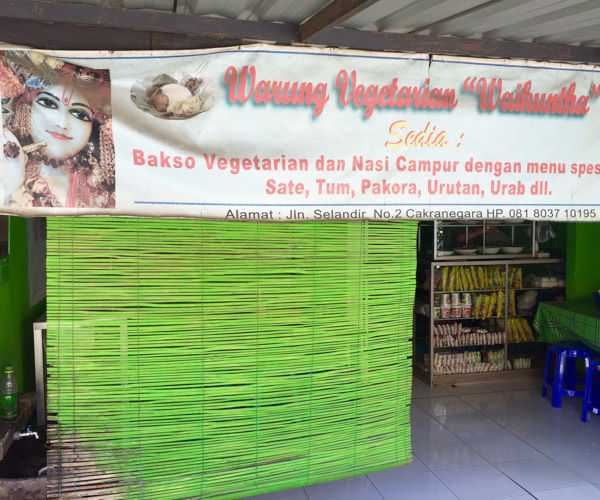 And of course, Happy Cow is your friend as a travelling vegan so here’s their Lombok page! 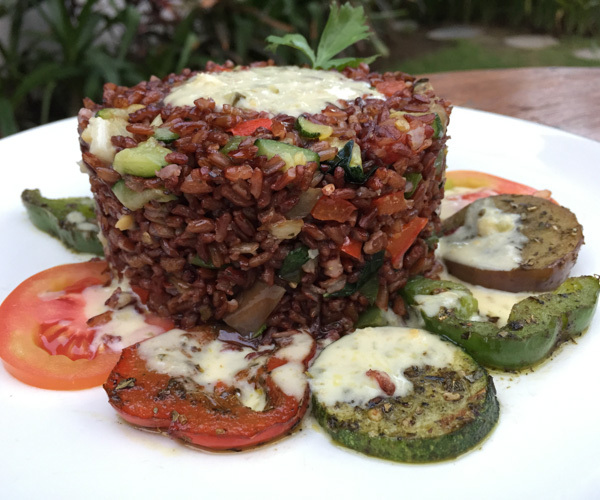 If you’ve written your own vegan guide to Lombok or have read one online that was helpful please let us know and we will add the link here.